In my twenty-odd working years, I’ve held many jobs. Some of them, though short-lived, could even be considered careers. I was a cashier, a seamstress, a chemist, a radio producer, a home-party consultant, a tourism coordinator, and an events planner. I also dabble in free-lance writing, and I’m currently pursuing some new business ventures. But there’s one money-making hobby from my past that always seems to surprise people when I tell them: for a while in the late 90’s, I made cakes. Wedding cakes, birthday cakes, anniversary cakes, etc. Occasionally I would charge people for them, but mostly I gave them as gifts to family and friends. 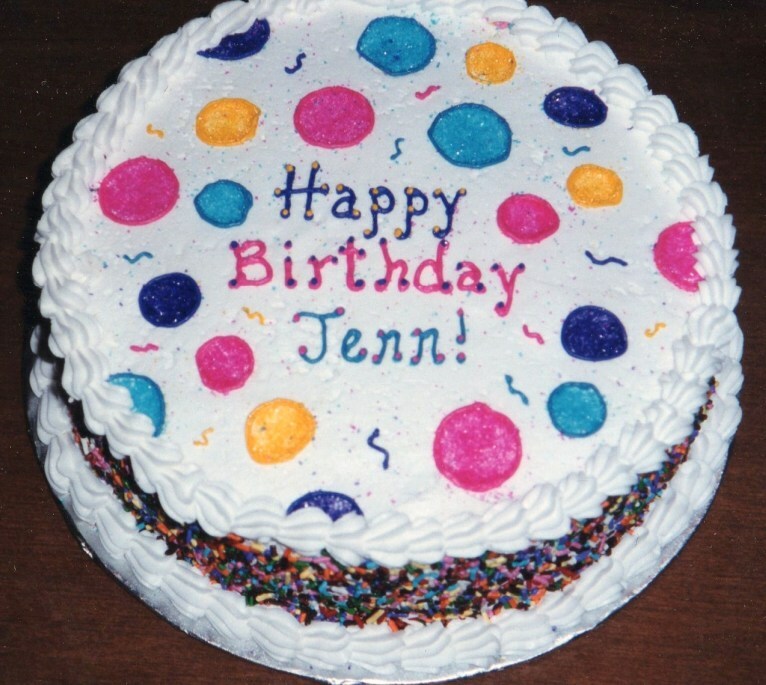 I started by taking a beginner Wilton Cake Decorating class at A.C. Moore sometime in 1995 or 1996. It was a blast, and I was pretty good at it (I think). I followed up with the Level II and Level III classes, and from there I began offering myself up to friends and their go-to cake maker. Friends and co-workers began asking me to make cakes for bridal showers, baby showers, kids birthdays, parents anniversaries, and weddings. My skills improved markedly over the years; some of the early cakes were not really that good – I was still developing technique. But the later ones turned out pretty good (not quite professional, but better than average). I actually even almost became an instructor; Wilton recruited and accepted me, but the job would have involved me driving three hours round trip twice per week, and the pay wasn’t enough to even cover the cost of gas. I took photos of just about every cake I ever made, and I thought it would be fun to share them here. I love looking at these photos, because every one of them tells a story from my life. Since I made the majority of these cakes for family and friends, I was usually present at the events where they were served, so the photo gives me an instant flashback to my past and often brings me a smile or a laugh. Why did I stop making cakes? Two reasons: I began to resent the smell of buttercream, and I also developed carpal tunnel syndrome. 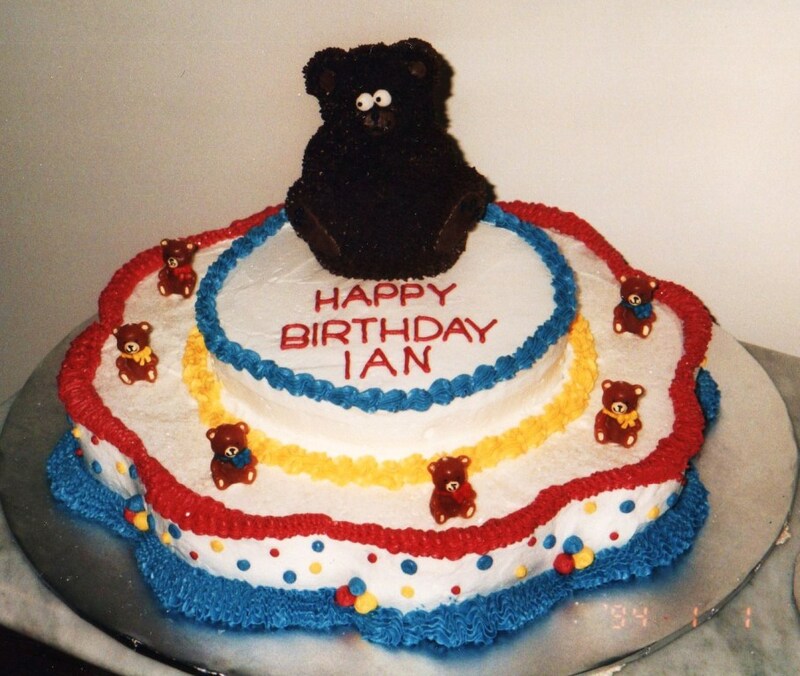 I’ve since had surgery to repair the carpal tunnel, but I never really got back into making cakes after that. Though, two years ago I briefly re-entered the field to make a wedding cake for a co-worker. But, nothing since then. I’m just not that into it anymore. Some of my favorite photos and stories after the jump, plus a gallery of all the cakes I could find photos of. 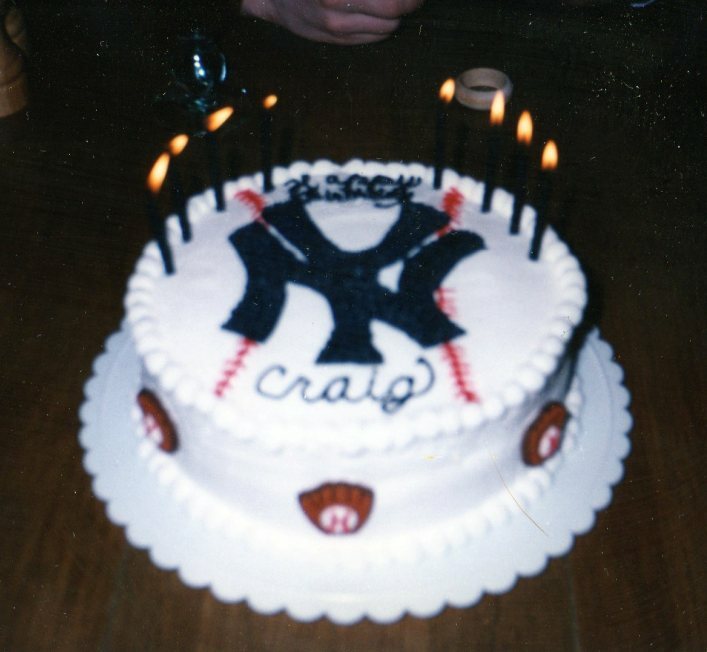 One of my earlier birthday cakes, from a time when most of the men in my life were Yankees fans (and when I possessed a crappy camera, apparently). This particular cake was for my sister’s ex-boyfriend Craig (we’re all still friends, so it’s ok). I have another similar cake that I made for my ex-husband, but I’m not showing that one here. We’re definitely not still friends. A birthday cake for my former co-worker Theresa’s daughter. This one reminds me of Blue Circle Cement, where Theresa and I worked. She’s still there; I moved on rather quickly. But I still have fond memories of my co-workers – so many great people. Another wonderful memory. 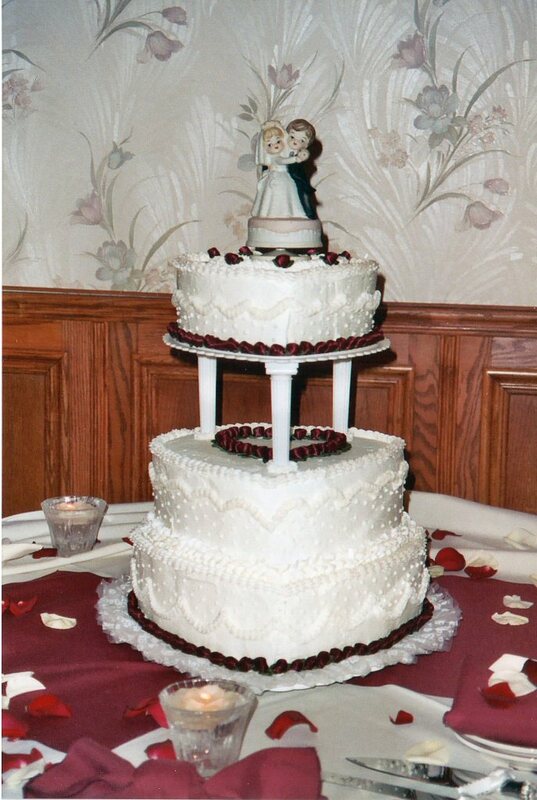 This is the first wedding cake I ever made, for my friends Wayne and Cheri in 1996. Also co-workers from Blue Circle Cement. Wayne and I worked together in the lab, and he taught me so much – about cement, about fixing things, about life. He also introduced me to Car Talk on NPR, for which I am eternally grateful. Wayne was much older than me (he was close to retirement when I started working there), but he was truly one of the greatest friends I’ve ever had. Wayne passed away last year, and I’m still crushed by the loss. He and Cheri were a big part of my life back then, in so many ways, and I miss him terribly. Rest in Peace. A birthday cake for my friend Debbie’s son’s 1st birthday. I don’t remember the year; it was definitely not 1994, even though that’s what’s printed on the photo. I’m thinking more like 1999. Debbie was a friend I met through our Daughters of the American Revolution chapter (yep, I’m a DAR). Debbie and I had a lot of fun together back then, but I’m not sure where she is and what she’s doing now. I’ll send some good thoughts out into the universe for her and her family. I hope they’re doing well. For my cousin Gabby’s 8th birthday in 1997. 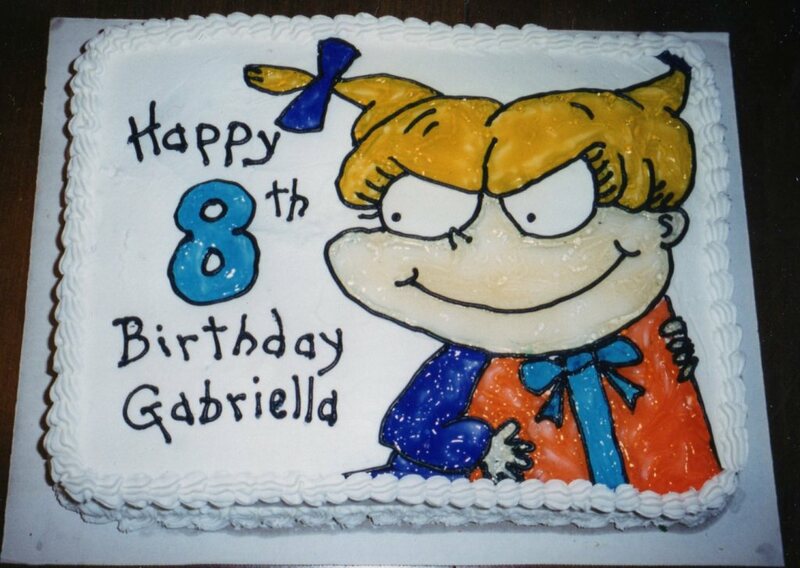 Gabby is 22 now, and probably doesn’t like the Rugrats anymore. This cake was fun; Gabby gave me one of her school folders that had a tiny postage-stamp sized picture of the Angelica character on it. I made a photocopy, enlarged it about a million times, and created a wax-paper stencil that I traced onto the frosted cake with a toothpick. I then did the outline with black buttercream, and filled in the lines with colored gel. She loved it! For my friends Marlene and Chris‘ wedding, in July 1997. One of my favorite cakes. What this picture doesn’t show is where the side of the largest cake got crushed in the box as I was bringing it to their reception hall. My fiance (we got married three months later) drove a Mitsubishi Eclipse at the time, a tiny sports car with an even tinier back seat. The cakes were in the back (why not the trunk? I have no idea), and Mike took a corner too fast or something, sending the cake flying into the wall of the back seat and flattening it on one side. There was a lot of yelling that happened on the rest of the trip (and the rest of the marriage, if we can be honest). Luckily, I always brought extra frosting and decorating bags with me. I managed to disguise the damage, mostly by turning that side of the cake towards the wall. No one noticed. Marlene and Chris will be celebrating their 15th Anniversary this summer, and they just welcomed their beautiful baby girl Jules into the world! Congratulations and best wishes for a lifetime of happiness, you guys! This is hands-down my favorite cake of all time, made for my friend Kelly’s first baby shower (her baby is now in middle school!). 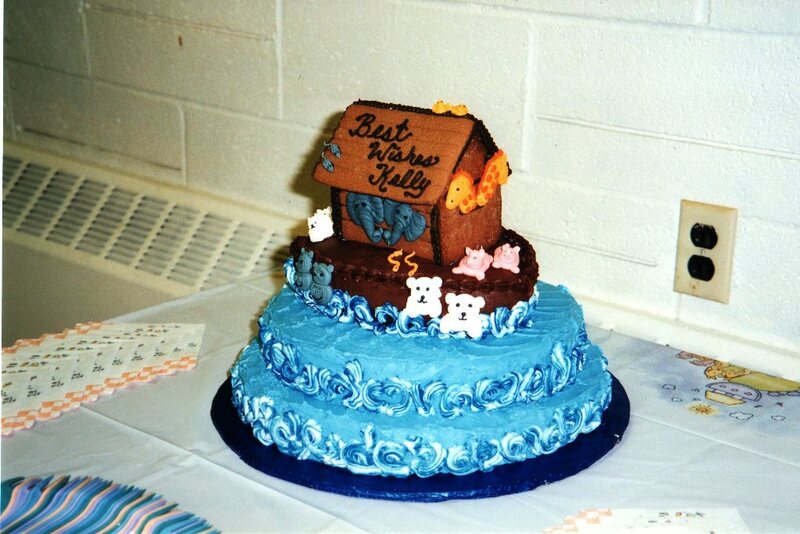 Our friend Jen (party planner extraordinaire) asked me to make a cake using Kelly’s theme – Noah’s Ark. I spent weeks before the shower hand-piping each of those animals out of royal icing and crafting the ark out of gingerbread. I’m still amazed at how cute those little animals all turned out. Days before the shower, I baked the cakes. The night before (I’ve always preferred to work at night), I began to assemble the cake. First, I assembled the bottom tiers. Then I placed the boat cake on top (which was made from half of a football-shaped pan), and decorated everything. Lastly, I thought it would be a good idea to stabilize the layers by inserting a dowel all the way through the center of the tiers. This would prove to be my fatal mistake. About an hour later (around midnight), I noticed that the boat cake had split in half and was beginning to crumble onto the round layer beneath. All the frosting in the world wasn’t going to fix it. My husband was just getting out of work, so I called him frantically crying, begging him to go to the store and buy me shortening, powdered sugar, eggs, and another box of cake mix. When he finally got home with the goods it was around 1:00am, and I had to bake another boat cake, allow it to cool, and then finish decorating the whole thing. Yes, I was up all night. I went to the shower later that morning, having gotten no sleep at all. But that cake looked AWESOME! This one makes me a little sad. I made it for the wedding of my friends Brian & Julie. It makes me sad because I haven’t seen Brian or Julie since my divorce seven years ago (I hate that friends are often forced to take sides). I guess posting this photo is my way of telling them how much I miss them and would love to see them again. If anyone still keeps in touch with Brian, will you let him know? 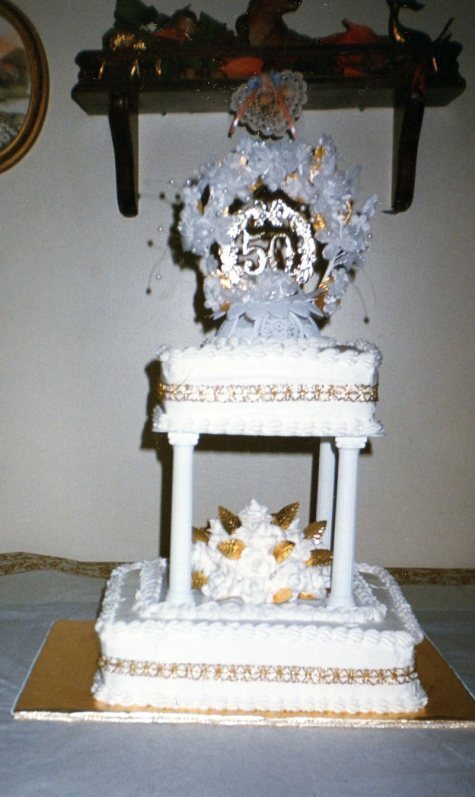 I made this one for my grandparents’ 50th wedding anniversary in 1996. 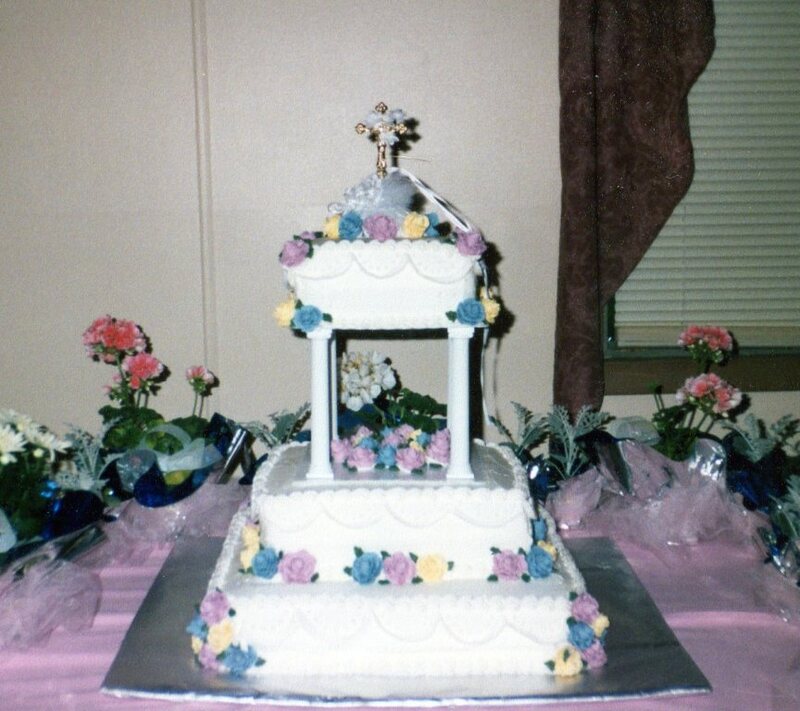 My grandmother cried when she saw it, because she never had a wedding cake; she and Papa had taken their vows in front of a Justice of the Peace and never had a reception. I was so glad I was able to give them the beautiful cake they never had. Grandma & Papa passed away in 2008, within three weeks of each other. They had been married 62 years. Photo gallery below. Click on any of the photos to open the gallery. Most likely a birthday cake for one of my sisters. Made for my boss’ stepdaughter’s wedding. Circa 1998. This was the cake I came out of retirement to make. Mazel Tov Theresa and Adam! An anniversary cake for Janet & Franz. This was a paying job, and I can’t remember any details other than that I had to drive to Canajoharie to drop it off. I can’t remember who I made this for, but I seem to recall it was for an “emergency” wedding. I wish I remembered the details. 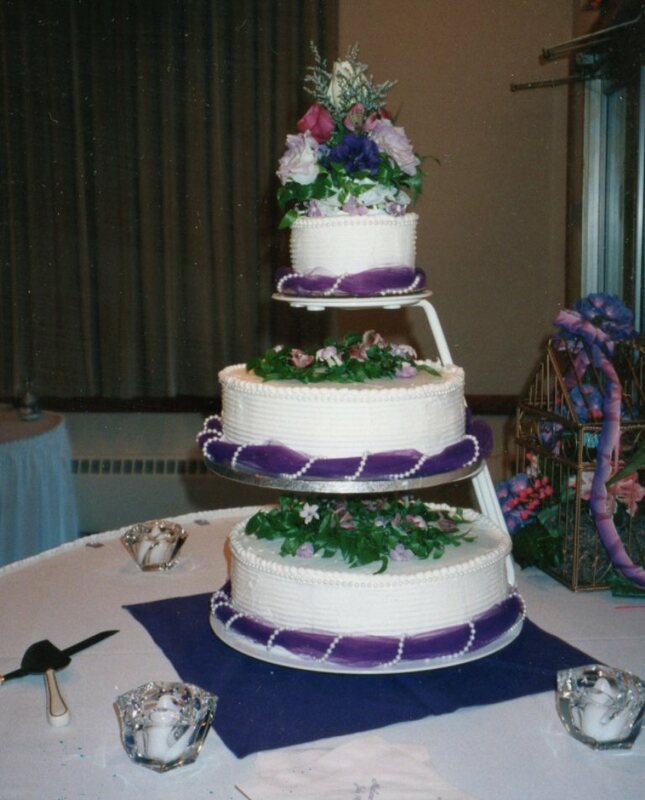 This was the first cake where I used basketweave. And the flowers were pretty good, too. I had the worst camera ever. I made these for a friend’s bridal shower. 36 individual cakes, each painstakingly decorated. My hand was cramped for days, and I walked into the shower hunched over like a witch. For my friends Donna & Adam’s wedding, somewhere around 2000. Great wedding! For my friend’s son’s birthday. Obviously Jeff was a basketball fan. Another birthday cake for one of my sisters; I”m guessing it was for Leanne. She and I both love Tigger. I seem to recall my mother carrying this across the room, tripping on something, and dropping half of the cake on my ex-husband’s head. Made for my former brother in law, to celebrate two auspicious occasions: his 21st birthday and his departure for Basic Training. Note the beer cans embedded in the side of the cake. Next Next post: So, I Have This Mango. Awesome cakes all around! I never knew ours got smooshed, so you must have done a great job hiding it. Of course, that whole day was kind of a whirlwind, so I probably wouldn’t have noticed it even if you pointed it out to me. Apparently we didn’t take a picture of the beautiful sunflower cake you made for my wedding shower. I still have the sunflower topiaries that you made for centerpieces. They decorate my cubicle at work. Trust me people, it was awesome. Sunflowers are my favorite flower and Wendy, as host of my shower, totally delivered. It was a beautiful cake! I totally forgot about the sunflower cake! In fact, I’m having a hard time picturing it. Did your mom take a photo of it??? Someone must have a picture. I’ll bet Mom does, or I have one buried in a box of old photos. I know I have pictures of the shower…. It had a beautiful basket-weave with lots of sunflowers on top. I think it was a big rectangle cake. Wow, I had no idea. Gorgeous cakes. I have absolutely zero cake decorating skills. Very impressive.